The LIFX is another – brilliant – project being funded by the Kickstarter model, and I’m pleased to say that it all started with an Aussie inventor, Phil Bosua. Phil regards the light bulb as one of the great inventions, but one that has been essentially unchanged since the late 1800s. After six months work, Bosua and his team have come up with the LIFX (pronounced ‘life X’), the “world’s smartest, most energy efficient light bulb”. The LIFX is an LED bulb, with the system controlled by one master bulb, which is WiFi-enabled. It will be available in three connection types – bayonet cap, edison screw and downlight. It will work in a voltage range from 110v to 260v, so it’s suitable for use in most countries. The prototype LIFX is rated around the 60 watt mark. Power usage is around one-tenth that of a standard incandescent bulb, and a LIFX bulb should last 25 years / 40,000 hours. 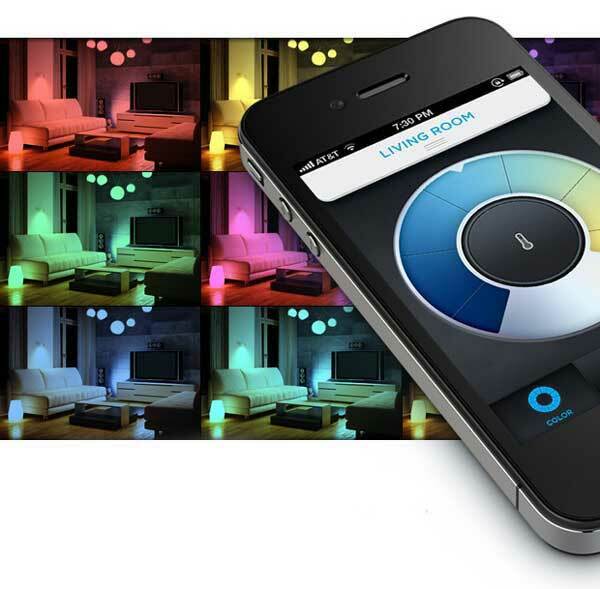 While the LIFX can be operated by a regular light switch, the real advance is that it can be controlled by a smartphone app. With the app, the LIFX bulbs can be controlled from anywhere, either bulb by bulb, or the whole house, office or business. The bulbs can be dimmed, change colour, match music, work as night lights, and more, and all controlled via the LIFX app. If you think the LIFX is smart now, the company is also making available a LIFX Software Development Kit, so a lot more functionality will be added when developers all over the world think about how to add new features to the LIFX system. [jbox color=”yellow”]WOW! We were hoping LIFX would resonate with you guys but never ever imagined you would fall in love with our smartbulbs as much as we have and so quickly. A huge thank you to everyone that has already pledged. We are completely blown away by your support! A pledge of $69 will net you one bulb, $119 will see you receive two. Higher amounts pledged, the more LIFX smartbulbs will be received. The projected delivery date of the LIFX is March 2013. To contribute, visit the LIFX page on KickStarter. So, what do you think? Pretty neat idea, isn’t it! I’m particularly looking forward to the possibilities that releasing the Software Development Kit will bring. One idea that could go wrong is the LIFX light changing colour when new Facebook or Twitter updates are received. I can see people with huge social media follower numbers going crazy Cold War torture style! I’ d love to hear your thoughts on the LIFX. Leave your comments in the ‘Leave A Reply’ section at the bottom of this page.